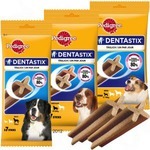 I have bought these dental treats numerous times for my small dog. He never turns his nose up at them. They definitely help to make his breath fresher. My dog loves this. He hides it and chews them. Best for a dog to fight bordom for sure he thinks they are just fun to play with as well as eat! He always wants one. My dog loves them ! My Shih-Tzu loves this treat ! He can't get enough. In addition, I've seen an improvement in my dog's oral health ever since I started giving him one Dentastix a day. 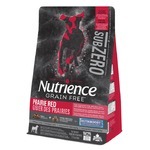 i have a chihuahua who doesn’t like most treats and is pretty picky but she loves these! they aren’t too pricey and you can pick them up anywhere! i love them! 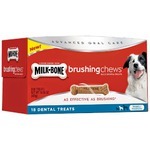 My dogs love these treats and it take them awhile to eat them but they are not very effective when it comes to cleaning their teeth. The ones sold at the vets are much more effective. Great chew that keeps my jack Russell’s teeth clean! He jumps and jumps when he sees them on the counter. He sniffs them out of my grocery bag before I get a chance to put them away! Not a replacement for brushing but nifty! 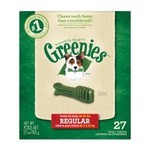 Our jack russell loves these things - they really help her breath and do get rid of some plaque. She still needs her teeth cleaned though, not a replacement for that for sure. what's all the bark about? okay, so I gave this to my doggy, at first she was not interested at all, and then slowly, over the next few (three) days sniffed at it a bit and finally decided that it wasn't harmful and decided to chew/eat it. and dogs eat eat anything?